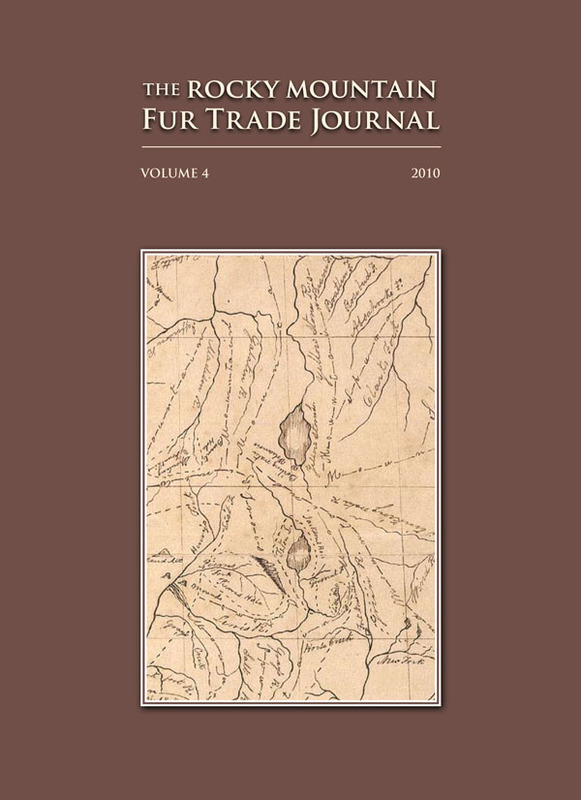 The fourth issue of the Rocky Mountain Fur Trade Journal is now complete and available for purchase online through the trading post. We appreciate all the authors that were willing to submit papers and give this publication a chance. We also owe a debt of gratitude to the peer reviewers who lent us their expertise and credibility. Was Meriwether Lewis the Godfather of the Rocky Mountain Fur Trade? John C. Jackson and Thomas C. Danisi coauthored the biography Meriwether Lewis, which is going into its second printing. Jackson’s new book on John McClallen, By Honor and Right: How One Man Boldly Defined the Destiny of a Nation, will be published in fall 2010. Thomas C. Danisi is an independent researcher and writer who has published articles on the fur trade. His particular interests are early St. Louis history, Lewis and Clark, and James MacKay’s 1797 map of the Missouri River. An avid researcher, Clay Landry’s study and writing on the material culture items used by the men of the Rocky Mountain fur trade has resulted in numerous published essays. A registered researcher with the Fur Trade Research Center, Clay has presented papers on fur trade material culture at the 1997, 2000 and 2006 Fur Trade Symposiums. He has conducted demonstrations and seminars on mountaineer clothing, food, horse gear and trade goods at various national historic sites throughout the West. He has served as a Journal reviewer and this is his third article for the publication. Stephen V. Banks of Dubois, Wyoming is a lecturer and re-enactor of the Rocky Mountain fur trade. Banks studied western history at the University of Wyoming, has written several articles and produced a web site for Wyoming’s K-12 schools about this time period. Banks is a retired IT consultant for the Dubois School District. Tim V. Tanner was educated at Utah State University and the California Art Institute, and embarked on a career as an illustrator in 1989. His artwork has graced the pages of national best-sellers and popular magazines. An avid historian and fur trade re-enactor since the late 1970s, Tanner is a member of the American Mountain Men, and a founding member of the American Longrifle Association. He currently chairs that organization’s National Standing Committee on Authenticity. Tanner is on the art faculty at Brigham Young University/Idaho and makes his home in “Pierre’s Hole” (Teton Valley), Idaho. Scott Walker would like to thank the Hudson’s Bay Company Archives, Archives of Manitoba, and especially Archivist Debra Moore, Head of Acquisition and Special Media, for assistance with this article. Walker lives in Colorado where he is a freelance writer and stay-at-home dad for his four-year-old daughter. He volunteers at Fort Laramie National Historic Site, where he interprets local fur trade history. E. Rick Williams currently serves as an administrator for Brigham Young University, and is a member of the American Mountain Men. He has also participated in the Living History Days presentations to school children in May at the Museum of the Mountain Man. Alida Boorn is an American History doctoral student at Kansas State University. Her primary interests include the history of Amerindians and the history of the fur trade in North America. Alida has presented papers at the 2006 and 2007 Western History Association Conferences. She extends special thanks to professors Craig Miner of Wichita State University and Albert N. Hamscher of Kansas State University. As a non-traditional blind student, Alida wishes to acknowledge the logistical support her husband, Jim Boorn, provides. He patiently assisted her in learning to use audio software to perform her work. Rich Aarstad has worked for the Montana Historical Society since 2001. He served as the society’s Lewis and Clark Reference Historian through the bicentennial and served for a short time as the Montana representative on the David Thompson Bicentennials Committee. In 2007, Aarstad co-chaired “Beyond Borders and Boundaries: David Thompson and the North American Fur Trade Symposium” held in Helena. Rich has had one article published on Montana’s fur trade in Montana, The Magazine of Western History. He continues his research on Montana’s fur trade, focusing primarily on the period between 1807 and 1820. Dr. John L. Allen is a well-known teacher, lecturer, and author in the field of historical geography. A native of Laramie, Wyoming, Dr. Allen is the author of numerous books and articles, including Lewis and Clark and the Image of the American Northwest and Jedediah Smith and the Fur Traders of the American West. He was editor and primary contributing author of the three-volume collection, North American Exploration. Dr. Allen recently retired from his position as Professor and Chair of Geography at the University of Wyoming. His current research interests include the changing landscape of the American West in the nineteenth century and the Jeffersonian period Rocky Mountain fur trade explorations. Bradley C. Bailey is a member of the American Mountain Men and founding member of the Rocky Mountain Outfit party (www.rockymountainoutfit.com). Bradley is an accomplished brain tanner who spends much time putting the skills and equipage of the mountaineers to the test as well as doing public demonstrations. He resides near the source of the Arkansas River in present day Buena Vista, Colorado. Nathan E. Bender is a former Professor of the University of Idaho Library special collections and archives. He has built historic research collections at the Buffalo Bill Historical Center, Montana State University, West Virginia University, and the University of Oklahoma. Publishing on western history, folklore, and American Indian studies in a variety of research journals, he is currently an independent scholar in Laramie, Wyoming. His article “Perceptions of a Mountain Man: John ‘Jeremiah Liver-Eating’ Johnston at Old trail Town, Cody, Wyoming,” appeared in RMFTJ Volume 1. Dr. S. Matthew DeSpain is a lecturer in the Native American Studies program at the University of Oklahoma, where he teaches a wide range of courses related to Native American and western American history, government, and culture. He directs publication of the Native American student journal Native Matters and serves as editor of the Journal of Chickasaw History and Culture. His current research focuses on cultural collisions in the American West, masculine identity in the West, and social constructs in the Far West fur trade. His article “‘The Superior Dignity of Such a Character:’ Nineteenth-Century American Manhood and the Image of Kit Carson,” appeared in RMFTJ Volume 1. “Teton” Todd D. Glover, BA, Brigham Young University, recently retired after twenty-five years serving in the military. He has participated in numerous living history events and spends much of his time researching, experimenting and recreating the lifestyle of the historic Rocky Mountain based mountaineers of old. He is a Hiveranno member of the American Mountain Men. Gene Hickman has pursued historical interpretation for many years, focusing on Lewis and Clark and the western fur trade. In the service of western American history, Hickman has worked with the Army Corps of Engineers, the National Park Service, the U.S. Forest Service, Montana Fish, Wildlife and Parks, and others. He has written numerous articles related to Indian Sign Language, Lewis and Clark, and the western fur trade, and is known as one of the best Indian Sign Talkers around. Hickman is a Hiveranno in the American Mountain Men and currently serves both as the Booshway for the Manuel Lisa Party and the Brigade Booshway for Montana and North Dakota. Alex Miller is a member of the American Mountain Men and is a frequent contributor to Muzzleloader Magazine. He has published a wide variety of articles and short stories related to the American fur trade. His article “The Yankee Pedlar: Introduction of Percussion Lock Firearms into the Far West,” appeared in RMFTJ Volume 1, and he has served as a peer reviewer for the last three issues. In his other life, he is a writing instructor at College of the Siskiyous in northern California. Mike Moore has published four nonfiction books and over 130 articles on the early American West. He has appeared on the History Channel and gives lectures on all aspects of the historic West. Moore is a member of the Western Writers of America and has been a staff writer for the last eleven years for On The Trail magazine. Dr. Kerry Oman received his doctorate from Southern Methodist University. He is a two-time Spur Award winner from the Western Writers of America for articles written about the mountain men. Gary Peterson and his wife Patty have lived and worked in Buffalo, Wyoming for the past thirty years. Peterson is an avid hunter, black powder enthusiast and student of western history. The Big Horn Mountains and Powder River country have provided him with a rich setting in which to pursue these interests. Peterson has written for Muzzleloader Magazine and We Proceeded On, the quarterly of the Lewis and Clark Trail Heritage Foundation. His article “Antonio Montero and the Portuguese Houses: An Outpost on Powder River,” appeared in RMFTJ Volume 2. Dr. Mark Schreiter spent much of his early life in the Bighorn Mountains of Wyoming. He holds a Ph.D. in history from the University of Idaho and specializes in environmental and Native American history of the Pacific Northwest. His fur trade studies focus on trappers’ relationships with tribes of the upper Missouri. Schreiter is professor of history and humanities and Chair of Academic Affairs at the University of Alaska/Kodiak College, as well as a budding documentary filmmaker. Dr. Darby Stapp has spent thirty years studying the history and archaeology of the Pacific Northwest. His M.A. research at the University of Idaho focused on the early sea-based fur trade and the copper items traded to local populations. His Ph.D. research at the University of Pennsylvania focused on the Chinese who lived and mined placer gold in northern Idaho. For the last twenty years, Stapp has worked on understanding and protecting important cultural and historic resources at the Hanford Reach National Monument, Mid-Columbia River, in Washington State. Having recently retired from this job, he has established Northwest Anthropology LLC to conduct cultural resource impact studies for tribes and agencies in Washington, Oregon, and Idaho. Dr. Brad Tennant is an Associate Professor of History at Presentation College in Aberdeen, South Dakota. Tennant is an active researcher, writer, and presenter on a variety of topics related to the northern plains and the American West. He currently serves as the president of the Board of Trustees for the South Dakota State Historical Society. His article “Fame Over Misfortune: La Verendrye and the Opening of the Western Fur Trade” appeared in RMFTJ Volume 1; “‘To Preserve Peace on the Frontiers:’ Federal Regulation and the Fur Trade” was published in Volume 2. Dale F. Topham, a native of Orem, Utah, received his B.A. and M.A. degrees from Brigham Young University. He is presently a doctoral candidate in American History at Southern Methodist University in Dallas, Texas. His article “Rocky Mountain Rivalry: The Hudson’s Bay Company’s Involvement in the American Fur Trade Rendezvous System” appeared in RMFTJ Volume 1. Jack Tykal, a lifetime Westerner, has lived in Utah since 1982. He spent two years in the U.S. Army, seven in banking, and more than twenty years working for the FBI. Jack retired and is now a writer. He has published several books and articles on western history, including Etienne Provost: Man of the Mountains; “Taos to St. Louis: The Journey of Mariá Rosa Villalpando” in the New Mexico Historical Review; and Journal of an Expedition to the Grand Prairies of the Missouri, 1840. Dave Vlcek has worked as a professional archaeologist in southwestern Wyoming for over thirty years. Mr. Vlcek’s specialties are prehistoric settlement patterns of the upper Green River Basin, remote sensing applications in archaeology, aspects of the fur trade (he organized the archaeological investigations of the 1832 Fort Bonneville site) and the national Historic Trail system in western Wyoming. Vlcek also lectures on aspects of southwestern Wyoming’s fascinating history and archaeology to school groups, to residents of Sublette County and to his professional peers on a regular basis. David Wright has earned countless awards for his highly acclaimed art, which captures memorable moments in American history. Professionally trained and with advanced study in Europe, Wright has been painting for more than forty years. His scholarship and historical sensitivities are evident in his works on the American frontier, settlement, and Civil War. Wright’s paintings have been featured in television documentaries and as covers and illustrations for numerous books and magazines. An avid historian, he has written for various publications. Wright has appeared on television as a historical consultant and served as Art Director for Native Sun Productions’ award-winning film Daniel Boone and the Westward Movement. He also provided art direction for the History Channel film: First Invasion – The War of 1812, for which he received a Prime Time Emmy nomination.